Forgot to mention that I found another nest incubating yesterday. In fact, she was laying an egg as I watched! When I pulled up this female was in this in between posture......not upright, but not in incubating posture. Kind of hunched over and she kept staring down between her legs. I watched her for about 20 minutes like that. The male arrived, he looked down too, and then she settled into incubating posture. Ah.....here we go! I was out there all day again today....so many nests. But the highlight of the day was going back to visit the male who suffered a fractured keel last summer. As many of you recall, he was in rehab for a month, leaving his mate alone to care for three chicks. When I released him back at his nest, I was surprised to have the female go after him as if he were an intruder. She was relentless in her nest defense, chasing him away for the last month of the breeding season and preventing him from bringing fish, though he tried. After the chicks fledged and one of them had dispersed, she began her migration, leaving two chicks still hanging around the nest and he was finally able to bring fish and remain in his territory. His parental instincts remained intact and he watched over his offspring until September. He was one of the first Ospreys to return this spring and he has been working very hard on his nest for several weeks now. Well, his mate finally returned in the past few days. She is unbanded but her markings match the drawings I had made of her. The story has a happy ending, as she accepts him, they are coexisting peacefully and copulating successfully. It was such a pleasure to watch them together today. When I left they were sitting side by side on the nest, snoozing. Yeah! Wishing them great success this year! First of all I must send out a huge THANKS to Cathy Gagliardi for the generous donation I received today! Made me cry! You have no idea how much it means to me to know that what I am doing matters to people and that they are willing to show support like this! I am deeply grateful! Also a big THANKS to Barb Ankrum for all the time she has been devoting to trying to read those damn bands in the past week or so. It's often so frustrating, and requires so much patience and perseverance. Some Ospreys are cooperative, and some are not. I appreciate all you do Barb! Today I visited 18 nests, 143 miles, trying to read bands and figure out what's going on. First of all, we have our first eggs!!!!! Chicks are on the way! I read a lot of bands, and some will require another shot at it. Oy. The sun and wind made it too challenging at those nests that I cant get very close to. I will have to try again on a cool, calm, cloudy day. The three "C"s. I found most nests occupied now, but a few are not....five nests had no Ospreys. The best part of being out there during these early days is to witness the "skydance". As usual, I can hear the vocalization that goes with that behavior long before I can spot the male performing this courtship ritual. He is often very high in the sky and hard to spot. Doing the dipsy doodle dance, undulating in the sky, up and down, usually displaying a fish and singing his heart out...."look at me, look at this magnificent fish I am offering". Many times I can see the female on the nest watching him intently. But it always cracks me up when you look at the female and she has her back to the male and is not paying any attention. C'mon honey! This is impressive stuff! Well, at least, I am impressed! OK! So maybe he is doing it for ME! And some older males do the dramatic display, with no fish...."you know me, you know I can catch a fish for you". ah, these days pass so quickly before we are into the ho hum incubation phase. Get out there and enjoy! We have had some conversations in the comments of our Facebook page (link on the blog page) about the Arboretum Cam, but I thought I would post here about that nest also. We initially saw a five year old male, N3, on the nest alone, but today the male from last year, Z3, has shown up with an unbanded female....which may be the same unbanded female as last year. (Z3 is now four years old.) This pair seem to have shown up together. The defensive behavior we are observing may be his reaction to N3 or other males in the area. We may see some chaos until things settle down here, as we did last year. Wishing them better luck this year! 113 miles and 21 nests today....lots more ospreys have been riding the wind back to their homes. I read some bands, waiting endlessly for some birds to show me their legs...some never did. I am still finding that it's quite a big game of musical nests this year. Also discovered one osprey nest taken over by Bald Eagles, and one taken over by Great Horned Owls. Ahhhhhh! Build your own nests! That, in turn, causes those Ospreys to show up in unexpected places! Oh, they keep me hopping! I keep plugging away at the huge task of gathering data! Trying so hard to get many bands read before the leaves come out and the eggs are laid. It's just so much easier during these early days, but it takes a lot of patience. Thanks to the volunteers who have been trying so hard to do the same. Sometimes we just have to share the frustration! But you must remember when you are waiting, waiting, waiting for a bird to turn around, or move to the nest edge, or return to the nest...breathe, feel the sun on your face, enjoy the cool breeze, listen to the sounds, notice the markings on the birds, be in the moment. There is pleasure amidst the frustration! Many more Ospreys are arriving back on their breeding grounds in the past week. I visited 16 nests today and 7 of them had at least one osprey....3 of those 7 had a pair present. I read 5.5 bands today. Some of these birds are our old friends, returning and connecting with their long time mates, but I am also finding new, younger birds at some nests. That doesnt mean they will remain there if an established territorial bird returns, the interloper is usually quickly chased off. At one nest I watched the established pair repeatedly escorting off a new pair that kept trying to land on the nest. Nest defense is part of the spring ritual. When new birds come upon a nest that is not being defended, they see it as an invitation to move in. Time will tell what the outcomes are on some of these nests. I am always happy to see old friends, but also know that not all of them will survive migration. We are still waiting for our oldest bird....hoping. At one nest I watched the female from last year with a new male in this territory. He came from a nearby nest that blew down last year. No sign of the territorial male yet. They were copulating and the male was clearly "guarding" her...sticking very close to prevent any other male from copulating with her. They were quietly canoodling, tho she was not always receptive to his attempts to mate...when suddenly they both shrieked and flew up into the air....I knew immediately what that vocalization meant. Eagles! Sure enough soon two juvenile Bald Eagles flew over the nest and both ospreys began dive bombing, chasing and screeching. The two eagles landed in some nearby trees but the Ospreys were relentless in their aggression....finally escorting the eagles out of the territory so they could return to their nest and continue getting better acquainted! This female was not completely open to this males advances, but she knows that she needs to hedge her bets....if her old mate does not return, she may need this guy. Always so interesting to watch. I was out and about again today. I met with some lovely folks who shared info about a "new" nest....new to me, tho it's been there a few years apparently. Then I checked about six other nests, read the band on one male...another old friend who I have been watching for many years. He was sitting quietly on his nest, alone, snoozing in the sun, waiting....but a perfect chance to read his band. I visited the nest that had a pair on Thursday....they are still there, still the same male...not her old partner, but this new young fellow. He arrived with a goldfish and flew circles around the nest, displaying the fish, but she did not food beg so he headed to a perch to eat it himself. It was clear he was offering it to her, but she was not hungry, or not interested in him. Time will tell! Still not too many Ospreys have returned, but new reports are trickling in of sightings...so we will keep making the rounds, identifying the birds when we find them. The strong northerly winds may be slowing some birds down. Patience! Today I visited 23 nests (96 miles) and found only ONE osprey! And he was at a nest where he didn't belong! But that's what happens this time of year! Some of them are checking out real estate! I was actually very happy to see this fellow because his nest blew down in a storm last July and I never saw him after that. So I was relieved to see him alive and well. Perhaps he figures why start rebuilding if I can find a new territory. I know that either his mate or one of his chicks was severely injured in that storm and was euthanized at the Raptor Center so he may need a new mate as well as a new home. He has had a tough time, nested unsuccessfully several times at one site, moved to another site and was successful for several years until that storm last year. I am rooting for him this year! 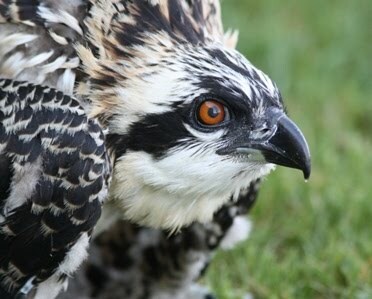 A very handsome Osprey!